The speech and language classroom is a great place to practice students’ IEP goals, but so many times that is the only place in which they successfully meet their IEP goals. As speech language pathologists know well, mastering goals in the general education setting is the first step towards generalization. So many times I find it tricky for a student who is working on articulation to move from reading passages to conversation. That is because I have difficulty finding stimuli that focuses on their speech sound. 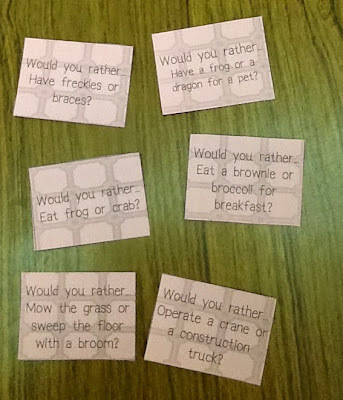 One of my favorite games to play with my students who are working towards correct articulation in conversation is “Would you rather.” This game is surprisingly difficult! Students often are considering their options at the same they are speaking, which makes it harder to remember to use the correct articulation - mimics unstructured conversation. The issue I have found is that I can’t seem to just make up “would you rather…” questions on the spot. So, I created small cards that give the question for us. This game has led to many laughs, confusion, and great carryover practice for my artic kiddos! 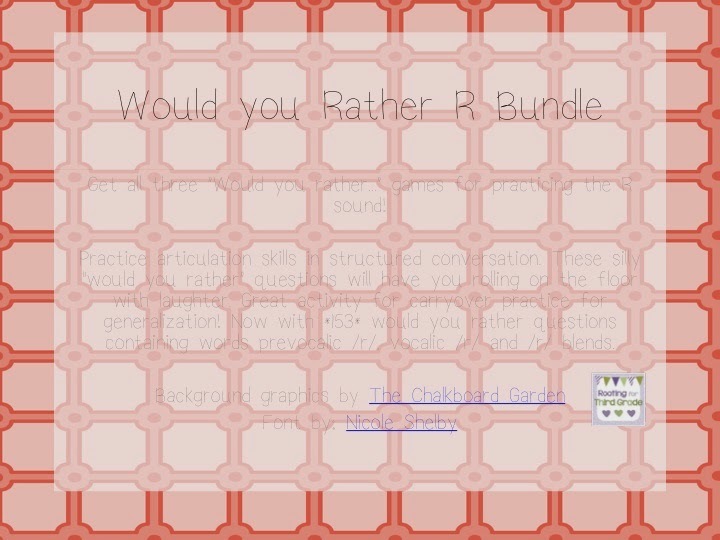 So far, I have managed to create would you rather questions for r, r-blends, l, l-blends, s, s-blends, and SH/CH. All questions are appropriate for kids. I print my cards on colored card stock in black and white to save money, however, the cards can be printed in full color. You can find my Would You Rather cards on my TPT site HERE. Which other sounds would you like to see made for this game? I’ve tried blogging before, but most of the time I forget that I even have a blog. Therefore, each blog has little to no posts. Forgive me if this blog becomes one of the forgotten. I am a speech language pathologist, almost 2 years out of grad school. I currently work for a school district in the Twin Cities metro area. Yes it’s cold here. No we don’t get school canceled unless it’s -40 degrees wind chill or more than 2 feet of snow. I used to live across the street from my current school, but then I got married. I have a wonderful husband, but his job is on the opposite side of the metro. We split the difference and both have a 20-30 minute commute. I don’t really mind the commute (unless it takes 2 hours) because I can listen to NPR or my latest Audible book. We recently added to our family by adopting a 5 month old kitten. He is adorable, but has more energy than expected. We’re working our way up to a family. If the cat survives, maybe a dog, then perhaps children. I’m sure my mom would be ok skipping the dog though. I have a passion for speech and language. My current position is at a K-8 school, which is challenging due to the number of teachers, range of student abilities, and the scheduling. If you are, or know anyone who is an SLP, you will understand that scheduling can be one of the most frustrating aspects of the job. I like to keep a record of all my schedules. So far, since September, I have had 11 different schedules. Last year, the total was 22. My caseload is considered full time at 44, but I have several students I am evaluating who will be joining the elite speech squad. I fell in love with the area of communication disorders because of the blend of science and art. I am a musician at heart and sang all the way through college in choirs and small ensembles. My knowledge of music comes in handy when working with clients (and teachers) with voice disorders. I originally wanted to become a neurologist, but the amount of schooling seemed like it was not worth it. So, when I discovered communication disorders, I knew it was a great blend of science and my passion for music. It's surprising how much music and speech have in common as I'm sure many of you know. That's just a little background information about me and how I stumbled into this great profession. One of my co-workers always ends her emails with "Teaching is a work of heart. Treat it with love." I feel this applies to speech and language as well. 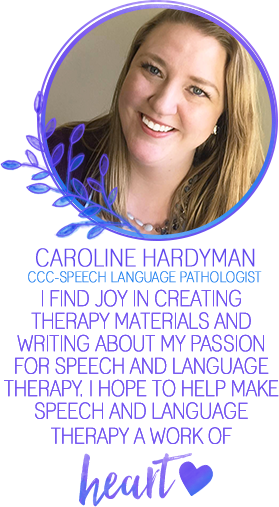 It is a work of science, a work of art, and requires the full heart of the speech language pathologist for clients to succeed and become better communicators. While we pour our hearts into work, our kiddos or patients worm their way into our hearts.